Overview: It’s said that you cannot keep a good man down. Guess what, the same could be said about a good blind man, too! So sit back and enjoy the ride as Daredevil enters the 1970s with a new love interest, a new hometown, and new foes left and right. Writer Gerry Conway came on board at the end of the last Essential. Traditionally when a new writer comes aboard, he or she likes to immediately put their own spin on the title, dropping past storylines from the previous writer, while introducing new situations. So Matt says goodbye to Karen Page, because his time as Daredevil keeps getting in the way of their relationship. Matt obviously needs a girlfriend in the superhero industry, someone who understands what it is like to wear the spandex and swing from rooftops. Enter the Black Widow, along with her guardian, Ivan Petrovitch. While we’re at it, goodbye New York City and hello San Francisco! Conway tries to toughen up Daredevil’s rouges. The Owl becomes a key foe, but is now outfitted with more weapons. A robot from the future travels to throw test after test at Daredevil. Man-Bull is introduced, giving Daredevil a Rhino-type physical villains to go up against. Purple Man returns and starts to actually be perceived as a true threat! The volume concludes with a crossover, as Daredevil and Black Widow team up with the Avengers to battle Magneto. When the battle is finished, the Avengers offer Matt and Natasha membership in their ranks. Matt quickly turns the Avengers down, but Natasha says yes. Not to worry, she doesn’t stay with the Avengers for long (considering her name is still on the masthead of the book), and she returns in the next issue of Daredevil to assist him in fighting Angar the Screamer. What makes this Essential? : Not to sound like a broken record here, but the reason to buy this Essential Daredevil book is for the artwork once again. If IDW would ever consider doing a Gene Colan’s Daredevil Artist Edition, I would be the first in line to pick this up. Daredevil seems so realistic on the pages, and Colan’s female figures in Karen Page and Black Widow are exquisite. In terms of the story, well, hmmm…. Gerry Conway writes the majority of this volume, so I will focus on him. The stories are very average. These are entertaining stories, but I don’t believe they are memorable stories. The biggest events are Matt Murdock finally breaking things off with Karen, and the law practice moving to San Francisco. So get this for the Colan art, and read it if you wish. Footnotes: Beginning with issue #93, the title was rebranded as Daredevil and the Black Widow. It would stay this way until issue #108. 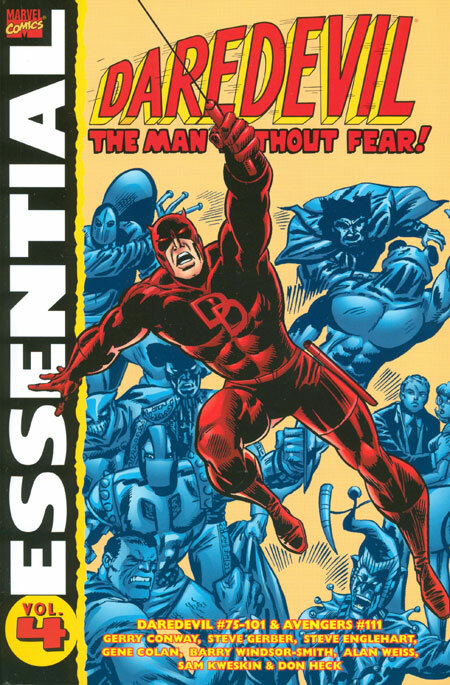 Daredevil #99 and Avengers #111 are also collected in Essential Avengers Vol. 5. If you like this volume, try: the Black Widow: Sting of the Widow hardcover. In 1970, Marvel relaunched Amazing Adventures as a new anthology book starring the Inhumans and the Black Widow. Written by Gary Friedrich with art by John Buscema, the Black Widow feature ran for eight issues, before she was bumped out of the book due to the popularity of the Inhumans feature. Not to worry, Black Widow immediately left that title to join up with Matt Murdock in Daredevil #81. The Amazing Adventures stories were collected in a premiere edition hardcover in 2009, around the time that Black Widow was making in her big screen debut in Iron Man 2. In addition, I know I recommended the first volume of Mark Waid’s Daredevil with Essential Daredevil Vol. 1. That title came to an end earlier this year and has relaunched with a new volume still written by Waid. With this second run, Waid has moved Matt Murdock and his practice back out to San Francisco, where many of the stories in this Essential are set. Any fan of Daredevil should be reading this series. This entry was posted in Daredevil, Marvel Essentials and tagged Daredevil, Gene Colan, Gerry Conway, Steve Gerber. Bookmark the permalink.